IF you are visiting Nantwich this month, be prepared not to get some good photographs in part of the town centre. 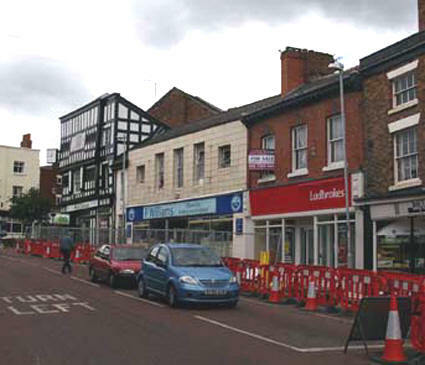 The problem is some road and footpath works being carried out to lay new gas pipes. Also - like the rest of the UK - Nantwich is sitting under what seem to be perpetual leaden skies. With the occasional thunder storm! Someone forecast a "long, hot summer" for us - but it is a long time coming. As I write this it is June 21, the longest day of the year and Sunday is the 24th or Midsummer's Day. We would normally be enjoying sunny days with either clear blue skies or - which I prefer - some white (not grey!) clouds. 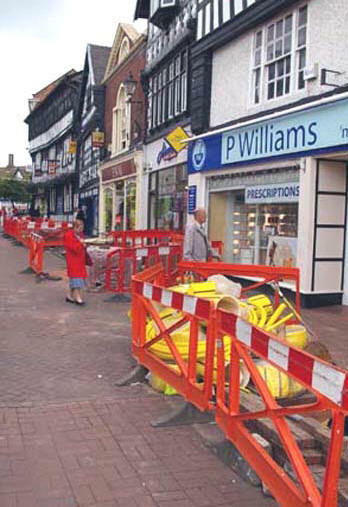 While the pipe-laying is very necessary, the orange safety barriers and the large wire cages in which some stock is kept will not do much for your pictures in part of this normally picturesque town. The work has to be done and no-one expects the workmen to do the pipe-laying in the winter months. Perhaps they were busy elsewhere in the Spring. will get some nice pictures - if the sun ever comes out. Of course, there will still be part of July and August when the work is scheduled to be completed, but that is no consolation if your holiday date is June. However, you will still be able to have a record of your visit to Nantwich as some shops stock postcards. Enjoy your visit or stay, and don't be put off by this letter! September 9: I see that Welsh Row is open again as work in the bridge area is completed and the road surface is all neatly restored. There are still some orange barriers by the bridge but they are simply enclosing road signs and the like awaiting collection (see below). There was some work being carried out in Swine Market. But both are a mere shadow of what there used to be. Almost the end of the Orange Peril. September 24: The last of the orange barriers have been removed.